The North American Porcupine is Canada’s second largest rodent, after the Beaver. In the Study Area, it is common to see several in a day’s wanderings, usually up in the tree tops where they feed. 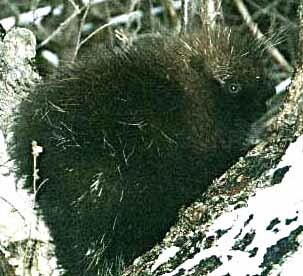 During the late 1980s, the Macoun Club surveyed the Porcupine population each winter, when the animals settle on relatively small winter ranges that center on their dens. Between 1987 and 1991, we documented an increase from 21 to 49 animals in the square mile (2.5 square km). We haven’t looked everywhere yet this winter, but have already identified 39 individuals, shown on the map at left. We estimate that the number will top out close to 80. The dots clustered at the top edge of the map represents an estimate of seven Porcupines in a rock-pile complex. Almost all the other dots represent either sightings of separate animals or else active dens visited. The one dot with a red center represents a Porcupine that was killed and eaten, presumably by a Fisher, at the beginning of March. On the last field trip, we found the remains — a freshly eaten-out skin — under the den tree. This animal had been alive and well on January 11th. To survive the extreme cold, Pocupines have a wooly coat of hair among their quills. Quite sensibly, they also retreat to their dens and sleep away the hours. In our Study Area, most dens are in swampy places where Cedar trees have been blown over by wind; they live underneath the roots. A few live in hollow trees or logs, or in cave-like openings in the rock. In wintertime, Porcupines feed mainly on the bark and needles of conifers, such as White Cedar and White Pine; they also eat the inner bark of deciduous trees, especially Sugar Maple. Although trees are always abundant, these are poor foods, and the animals loose weight dangerously on this diet. In a hard winter, some of them die. In early May, ravenous Porcupines scurry about in the treetops, cramming the swelling buds of Sugar Maples into their mouths. On lazy summer days, they eat green plants. And at the beginning of September, they hasten to fatten up on Red Oak acorns, Bitternut Hickory nuts, and Basswood nutlets. For an explanation of the colour-coded vegetation, see the main map page. All photos donated or provided by members and leaders, past and present. Created Feb. 22, 2003, by REL; updated Mar. 9, 2003. Photo of the Porcupine taken in the Study Area, March 9, 2004. Coding revised May 2016.